Safety Fundraisers work great for those safety weeks or fire prevention weeks. 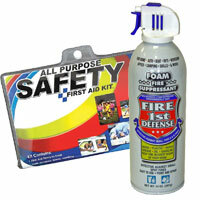 Saftey fundraisers work great, not just for schools, but for first aid departments and fire departments. Safety fundraisers generate 50% profit and help promote house hold and on the road safety. If you are looking to purchase Safety Fundraisers, please fill out the short form below or call (866) 674-7317 and we will find the fundraising dealer that will provide the best profit for you and your group.